A couple of months ago Martin came up with the idea to build a dustbin, that would take pictures of people using it and then send them to Twitter. We tried some different approaches and finally used an Arduino, a WiFly-shield and a c328 serial camera to build it. It worked really well and was a lot of fun. 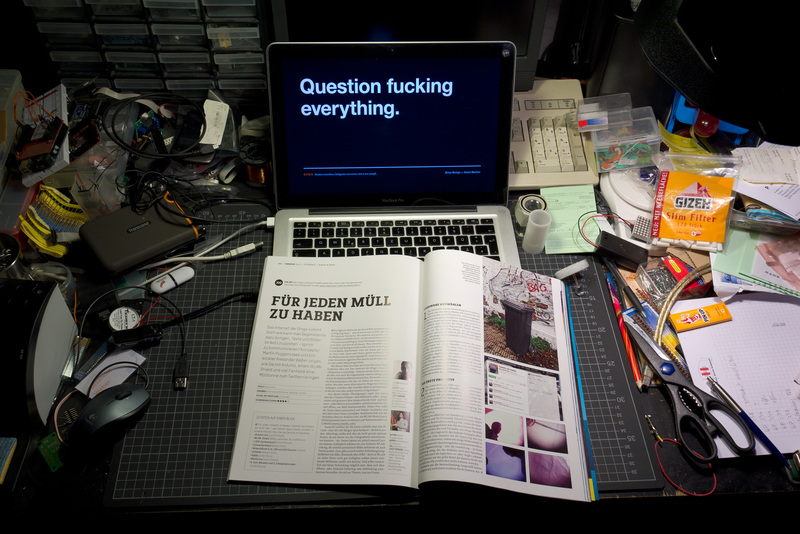 What you see there on my desk is the current issue (2011/01) of Weave. Weave is a magazine that covers interactive design and such. We were asked to write an article on “internet of things” and now, there it is. It’s a tutorial on how to use Arduino with twitter and how to take pictures and upload them. Here is a teaser of the article (in german). I hope to find some time soon to document the project in a separate post. We’ll see. You can follow @TweetsOfWaste to see any updates of the project and the first couple of pictures.